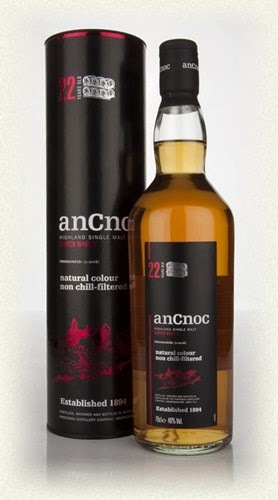 It’s finally time for me to try the anCnoc 22yo! The anCnoc whisky is a Highland malt that is produced by the Knockdhu disitillery (the name of the whisky comes from the distillerys water source). I’ve tried some anCnoc whisky before out of which the 35yo is my favorite so far. The 12yo and 16yo are very good ’standard’ whiskys. The 22yo is matured in a combination of bourbon casks and oloroso sherry casks, though a majority of the whisky has spent its time in bourbon casks. If you wanna go for it its available for just below €100 at Master of Malt. A big thanks to the nice people at Berntson Brands, and especially Evert, for sharing a sample with me! Oh yes, this is very nice, 46% ABV is actually quite perfect for a whisky in this style, very classic and fresh. First there is a warm sweetness mostly on dark raisins and honey, but there is also some kind of very very light liqourice there too. Then comes the bourbon stuff, something fudgy and vanilla, and then actually something reminiscent of Baileys, a mixture of cocoa, coffe and un-whipped hi-fat cream. After that something really warming and drying, not overwhelmingly so but just a little bit drying my mouth, a little bit herby. This is a very vivid and alive whisky for being 22yo and still it has something very mature about it. You should try it! Okay! It’s been a while since I posted a tasting note so let’s do something fun… post two tasting notes! 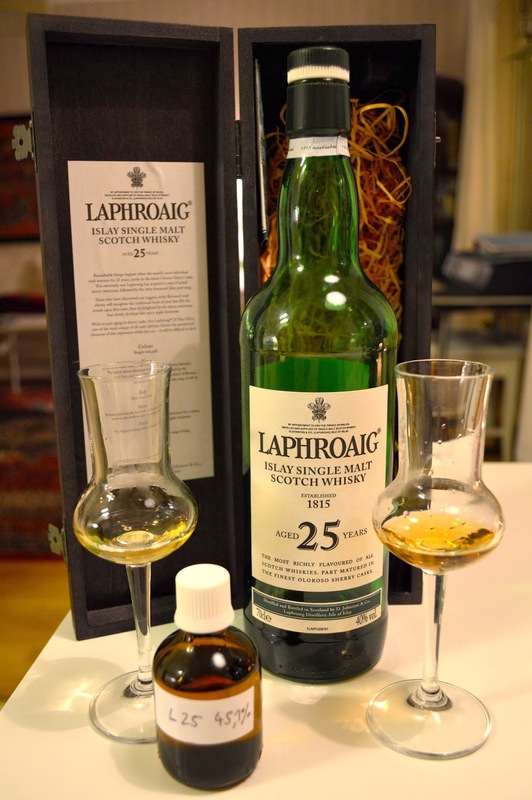 And what could be better than trying two Laphroaigs - that is the new Laphroaig 25yo 2013 edition against the very first edition of Laphroaig 25yo 2007 edition?! The first edition was not very popular amongst fans due to it’s only 40% ABV so after that release they started to release it in cask strength circa once a year. I’ve always liked the first version since I tried it the first time back in 2007, but I’ve never actually tried it against a CS version, so let’s do that! 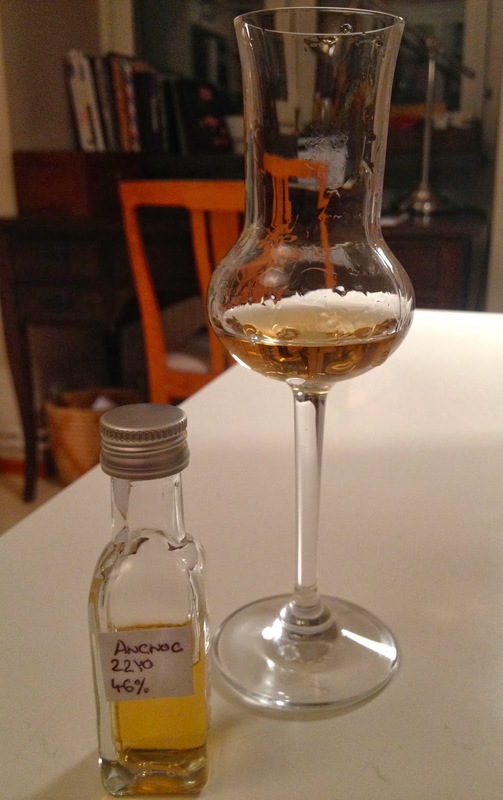 Laphroaig 25yo replaced the 30yo which was compeltely matured in 1st-fill oloroso casks. The 25yo is matured in a combination (50/50) of first fill bourbon casks and, as far as I have heard, 2nd-fill oloroso casks. Interestingly enough the 2007 edition (standing to the right in both pictures) is darker than the 2013 edition… Ok let’s try them head to head! Very very soft peat. Almost mint or even mint chocolate. Mmm… Pear, a lot of citrus in the very highest register, quite exotic in some way, very calm in profile over all. There’s also some touches of ashes in there. Also a little bit farmy if you know what I mean. Two completely different Laphroaigs already on the nose! There’s much less peat in this one. Also there is vanilla which I did not really pick up in the previous one. This version also seems less ”full-bodied” on the nose in some way, which is quite strange considering it’s higher strength… Also the citrus is not there, but it’s still exotic though, and farmy, and also seems dry or quite herby-ish… Dont’t get me wrong, the 2013 also has a wonderful nose, but just a little more… restrained. Mmm, sooo soft! The peat comes first and lot’s of sweetness in combo with liquid honey… Liqourice, cocoa… It’s very full-bodied for the first say two or three seconds but then it gets quite watery. It clings on for a good while though and mostly on the peat, something sweet and ashy and herbs, medium dry. Again, two completely different Laphroaigs! In this one the tastes in the beginning is more on citrus peal and a lot heavier on the peat (the tables are turned that is…). Also much more full-bodied and a bit more warming, not as elegant though, that is a bit rougher and "out there", but all of that is of course probably because of the higher strength. This one is also a lot longer in the aftertaste and more dry. None of these two are very heavy on the sherry influence, nor on the nose or on the palate… There’s more sherry influence in the 2007 though… They are both very good Laphroaigs but in their own way: if you like it elegant then go for the 2007 and if you like more ooomph then go for the 2013! I never thouht I’d like the 2007 more but today it seems as if I actually do… So let’s pour another dram of that one… Slainthé!